Is there a silver lining in the partial government shutdown? Has President Trump suckered Democrats and the Deep State into a trap that will enable a radical downsizing of the federal bureaucracy? In only five more days of the already “longest government shutdown in history” (25 days and counting, as of today), a heretofore obscure threshold will be reached, enabling permanent layoffs of bureaucrats furloughed 30 days or more. Correction, Oct. 1, 2013: This article originally understated the proportion of employees of the Department of Defense who have been furloughed. 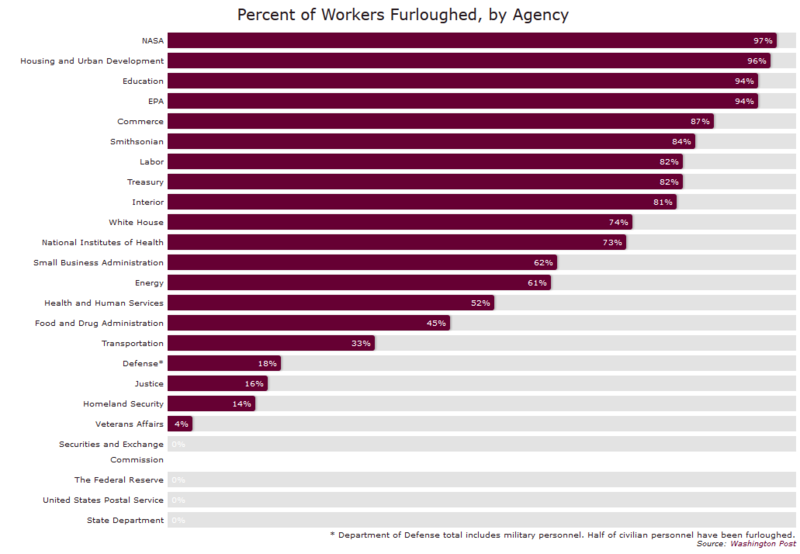 About 18 percent of the department’s total employees have been furloughed, not 5 percent. Monica Thomas issued a Hat Tip to our friend, Clarice Feldman at the end of her article. This entry was posted in Current Events, Government, News, Politics, Uncategorized. Bookmark the permalink. 7 Responses to Is there a silver lining in the partial government shutdown? Executive Order 10988 signed by John Kennedy January 17, 1963 allowed federal unions collective bargaining. Maybe vacating this EO would help the downfall of the public service unions. I am sure it would end up in the courts just like the DACA EO but Trump could use it as leverage against the rats just by tweeting about it. If President Trump vacated Kennedy’s E.O., the present House would simply pass a law allowing unionization of federal workers. It would still need to pass in the Senate and Republicans hold the majority. The Senate is where House Bills come to die. I’m for smaller government and hope, if this is the plan, that it works. This is really exciting. I hope it works out. The article at American Thinker says the author is Thomas Lifson, not Monica Showalter; she apparently added the bar graph from Slate. I corrected it! I don’t know how I made that error. Thanks! Interesting take……if Democrats buy this, it may make for an interesting discussion on wall funding.